The holiday season is coming to a close with the New Year beginning in a few days, so Happy New Year from all of us at Palladium Books. May it be a year filled with good health, prosperity and joy for us all. Time is running out to get a Christmas Surprise Package. As announced in the last Weekly Update, the Surprise Package offer is extended, but there are only two weeks left to place your orders. This extension has become part of the Grab Bag tradition as much as the Surprise Packages themselves, but time is running out! Get ‘em while you can before this offer is gone until next Christmas. Oh, and do not miss the new DriveThruRPG.com Sale of Rifts® PDFs titles including Rifts® Ultimate Edition, all Rifts® Dimension Books, all Rifts® Conversion Books, The Rifter® Numbers 1-77 (the only way to get many of the out of print titles like fabled issue #4, #17-35, #50, and many others), the Splicers® RPG, and a few other select titles all described below. All of this means it’s not too late to get that special someone or yourself that late holiday gift, or a gift for an upcoming birthday, anniversary, graduation, Valentine’s Day, or a treat for yourself. You deserve it, especially if you’re a hard working Game Master. More details below. This is absolutely your last chance to snag a 2018 Surprise Package as a gift for a birthday, anniversary, Valentine’s Day (it will be here before you know it), graduation, or a treat for yourself. A Surprise Package is an inexpensive way to try new games, new settings, fill holes in your collection, get caught up on The Rifter®, or replace battered old books. Whatever the reason, order soon, because this offer is almost over. Why extend this amazing offer? Because it is the nice thing to do. We realize many of you are so full of the Christmas Spirit that you spend your money on gifts for your loved ones rather than yourself. This wonderful act of charity often leaves no money for you to buy a Palladium Surprise Package for yourself. We think that sacrifice is pretty wonderful and what the holiday season is all about, so we extend the offer so that you selfless souls can pick up a Surprise Package after the holidays. We know this happens, because a lot of people over the years have thanked us for the extension for this very reason. The extension is also for you Johnny Come-Latelies who are so caught up in the holiday frenzy, work and life that somehow you miss placing your order for the Christmas Surprise Package before the offer ends. It is also for those of you who wish you had ordered one (or another one) but forgot. Lastly, it is our way to carry that holiday good cheer into the New Year. So get your post-holiday Surprise Package and enjoy. Please note that this offer will not be extended further. This is your last chance. And please spread the word to let people know the offer is extended for a short time. Happy Holidays. What is a Christmas Surprise Package? A way to get $95-$100 or more worth of physical gaming product (not PDFs) for the price of PDFs! For ONLY $46 (plus shipping and handling), get gifts for others or for yourself. And each book is signed if you should want autographs. It is our way of saying thank you to our many fans for their support. You are appreciated more than you may realize. The best deal of the holidays! You are likely to pay $50 or more for just a single core rule book, but for $46 plus shipping, you can get 4-6 books in a Palladium Surprise Package, depending on their retail value. Or you can get that core rule book and 2-4 sourcebooks. And we will sign the books if you request it. How do you beat that? It simply is the best deal in gaming! Our way of giving back to the fans and making the holidays special for you. A 20 year tradition of which gamers cannot get enough. Palladium Surprise Packages make the perfect holiday gifts for the gamers in your life. Whether you celebrate Christmas, Hanukkah, Kwanzaa, or the Winter Solstice, or you’re looking for a gift for a birthday, anniversary, Valentine’s Day, or any special occasion that falls between now and March, a Surprise Package may be the ideal way to go. You get a ton of stuff on the cheap, you can get a bunch of autographs, and you look like you spent a fortune. Fill holes in your own collection. Try new game settings – Rifts®, Palladium Fantasy®, Heroes Unlimited™, Splicers®, Nightbane®, Dead Reign®, Beyond the Supernatural™, Rifts® Chaos Earth®, After the Bomb® (mutant animals), Ninjas & Superspies™, RECON® and all the rest. Get cool stuff (miniatures, bookmarks, maps, prints, greeting cards, T-shirts, etc.). Request autographs and Kevin and available Palladium staff and freelancers will sign every book. Get something for your fellow gamers or favorite Game Master, husband, wife, brother, sister, child, etc. Be surprised when the package arrives. Please spread the word to gamers everywhere. People only learn about the Palladium Christmas Surprise Package offer by word of mouth, The Rifter® and our website, so please post and spread the word everywhere. Click here to get all the details or to place a Surprise Package order. 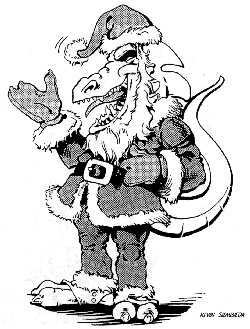 New Holiday PDF Sale from Palladium Books® – Ends December 30! 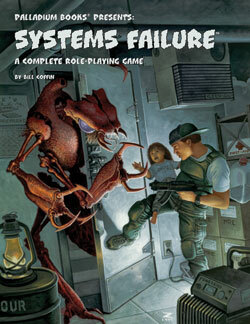 Explore strange new worlds and endless adventure with our Out of this World Rifts® PDF Sale. Load up for adventure and new game settings to carry you into the New Year. This is the last sale of the year on DriveThruRPG.com – end it with a bang. This sale offers the Rifts® core books, Rifts® Book of Magic, Dimension Books, otherworldly settings like Splicers® and The Mechanoids®, and The Rifter® #1-77. 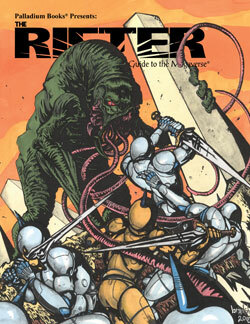 The Rifter is a great resource for new characters, villains, adventures and adventure settings. And remember, with just a little bit of work you can use an adventure for one setting, like fantasy, in another, like Rifts® or Heroes Unlimited™, and vice versa. That’s the beauty of a Megaverse® that uses the same fundamental game system! You can take monsters, villains, and even people and places, and with a little tweaking, use them in any setting. The sale takes place on DriveThruRPG.com – enjoy. A clue about the next sale: It’s the start to a monstrously fun New Year. Watch for it starting January 2 on DriveThruRPG. The year 2018 started out with painful challenges and great disappointment, but ends with excitement and hope for the New Year. We have a great many books planned and in active development. Some you know about, some have been hotly anticipated for a while, and some will be a pleasant surprise. Each and every new title should rev up your imaginations and offer a vast range of epic adventure and fun. As we noted earlier this year, while we will support all our game lines, our main focus will be on what we consider to be these primary four game lines: Rifts®, Palladium Fantasy RPG®, Heroes Unlimited™ and Beyond the Supernatural™ (BTS). I already have artists banging away on artwork for the Rifts® Bestiary™ Volume One and Two, Psychic Scream™, Garden of the Gods™ and In the Face of Death™, and will soon be assigning more art for several other titles. We appreciate your continued support of Palladium Books and your excitement for the new books listed above and many others like The Disavowed™, CS Arsenal™, BTS sourcebook and much more! Here’s to a dynamic and wonderful new year for us all. Please keep those imaginations burning bright and game on! Happy New Year. Every year there is a section where the customer can offer comments and suggestions with his or her Surprise Package order. Every year, in acknowledgment of our fans, and because they are fun to read, we offer a sampling in the Weekly Updates. Our heartfelt thanks to all of you who have stuck with Palladium through thick and thin. Keep those imaginations burning bright, have a joyous holiday season, and game on. You have no idea how much your comments and support mean to all of us. Everyone at Palladium enjoys reading your brief comments. They always brighten our day. Thank you. I have tried to write a short response [in brackets] when applicable. A.H. in Novato, California, writes: Thanks again for the Grab Bag! After shopping for everyone else, this is the one gift I always look for that I can enjoy myself. M.G. in Danville, Virginia, writes: I lost my old Rifts® book and I really enjoyed your game, [so I] look forward to returning to it and hopefully expand to Palladium Fantasy RPG® as well. O.M. in Louisville, Kentucky, writes: I’ve enjoyed these games for many years. Please keep up the awesome work! E.T. in Bellevue, Washington, writes: Favorites: Rifts® and Heroes Unlimited. I have been gaming since 1984. I am very experienced and believe this is one of the most versatile and best gaming systems around. I have enjoyed this gaming system for over 20 years. I have collected every book. I look forward to seeing what’s in store for the future. F.V. in Dallas, Texas, writes: I’m a huge fan of the horror genre and I really enjoy your games. Favorites: Dead Reign® and Rifts®. [I love horror too, F.V. 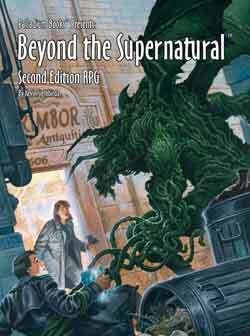 You’ll have to try Beyond the Supernatural™, especially after we release some of the new sourcebooks coming in 2019. R.P. in Winston Salem, North Carolina, writes: I have been out of the RPG element for many years, and when I was deeper into games Rifts® and Palladium Fantasy® were my preferred games. I am looking forward to getting back into the games. T.E. in Canmore, Alberta, Canada, writes, in part: I am just getting back into playing Rifts®. I used to play quite a bit ... so what better way to get back into Rifts® than to get a Grab Bag! ... Keep doing amazing work! J.H. in Richmond, Texas, writes: Thanks so much for the Grab Bag. For the first 10 years I used it to fill holes in my collection. Since then it has been a great chance to replace old books that I have, unfortunately, worked to death. C.A. in Crystal Lake, Illinois, writes: Love what you guys do! Keep up the great work! C.W. in Portales, New Mexico, writes: My wife used to buy me this every year, but this year we’re getting the Grab Bag for our oldest son, Christian. He’s 14 and a gamer nut like his old man. Thanks for doing these year after year! L.S. in Saskatoon, Saskatchewan, Canada, writes, in part: This surprise Package is for my husband and he doesn’t know it is coming in the mail. The game we play most is Rifts® ... the Palladium Fantasy® setting as well ... Anything signed would be appreciated. Thank you guys so much. A.K in Boston, Kentucky, writes: This is a gift for my nephew who is getting started in role-playing Rifts®. I am looking forward to introducing him to the greatest game on Earth. A.B.B. in Tenafly, New Jersey, writes, in part: ... Thanks for all you do. I hope you’re having a good holiday season. J.B. in Erlanger, Kentucky, writes: Merry Christmas and Happy New Year to Santa Kev, and the madmen and women of Palladium. All our best in 2019. Can’t wait to celebrate your success. Thanks for an amazing 2018 and the incredible Open House. E.V. in Webster Grove, Missouri, writes, in part: Favorites: Heroes Unlimited™, Rifts®, Beyond the Supernatural™, Nightbane®, etc. ... Autographs not necessary but totally appreciated ... I love you guys, please don’t ever go away. A high quality, soft touch Rifts® pen with stylus is now available. The pen fits very comfortably in the hand, has a nice, black ink and writes smooth and evenly every time. I have been using the sample pen for a month and love it. Everyone here loves this pen and you will too. Will be considered as a Surprise Package request. 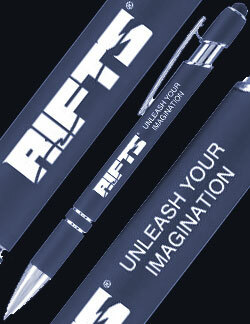 Rifts® Soft Touch Pen with Stylus. Dark blue exterior with silver tip and clip. Capacitive stylus for use with smartphones and tablets. $5.00 retail – Cat. No. 2586 – Available now. 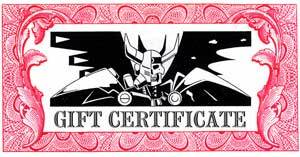 You asked for them, so due to popular request, you can now purchase Palladium Gift Certificates for your gaming friends and loved ones. The prompts should be pretty self-explanatory. You purchase the desired amount, fill out the email info of that person along with an optional gift message, and that individual gets an email with info on how to redeem the Gift Certificate and you get a confirmation email. Simple. The Rifter® #82 is all about discovery and unleashing the power inside of you. That’s true whether you are playing a Chaos Earth® Pyromancer™ learning to survive and save lives after the Great Cataclysm; or a newly awakened Nightbane® seeking his or her purpose in a dark world of conspiracy and demons; or a Heroes Unlimited™ vigilante trained to the height of physical perfection in a war against evil; or an RPG gamer like you and me, unleashing our imaginations to create wonderful new characters and epic adventures. This issue of The Rifter® also lovingly celebrates a master of unleashed imagination and big thinking, Erick Wujcik, ten years after his untimely passing. Bits of Palladium history and heartfelt sentiments revealed along the way. Enjoy. Rifts® Chaos Earth® – Pyromancy, Nebraska Part Three – by Daniel Frederick, Matthew Clements & Kevin Siembieda. 50+ Pyromancy spells, the Pyromancer O.C.C., Zone Twisters, notable characters, and more. “Official” source material. Rifts® Bestiary Sneak Preview – by Kevin Siembieda and Charles Walton II. A few choice new monsters to whet your appetite for the Rifts® Bestiary, Volumes One and Two, and the books to follow. “Official” source material. Heroes Unlimited – by Matt Reed. An expanded look at the unique heroes who do not possess super abilities, but rather turn their bodies into fighting machines via physical training and dedicated force of will. Nightbane® – Age Modifiers and Education Rules – by Mark Oberle. Tables and stats for determining an occupation and skills based on the age of the character. Plus more insight to being a Nightbane and a few new skills. “Official” source material. Gaming Advice from Erick Wujcik – Thinking Big and The Name Giver, sage advice reprinted from The Rifter® #1 & #2. Erick Wujcik Remembered – Erick touched countless lives with his big personality, inspiring mind, and body of work. Ten years after his death, Erick continues to inspire everyone who met him. Friends and fans remember this unique individual and his work. Insight to the man and Palladium Books, the company he loved. Written by Kevin Siembieda and many, many others. A celebration of life. 112 pages – $14.99 retail – Cat. No. 182. Available now. When the cities fell, and the world went "off-line," all seemed lost. Anarchy reigned. On an alternate Earth, all that is left are the Survivalists, Nature-Lovers, Farmers, Gun Bunnies, Eggheads and backwoods wackos living on the fringe. Either people found in remote regions or those who were prepared for the Y2K Bug and the collapse of civilization. Oh, and there are “bugs” alright. Alien, bug-like things that feed on energy and turn humans into zombie-like slaves. Things are worse than anyone could have imagined, even for those who were prepared. But these survivors are not ready to give up. America (and then the world) will be free! And they mean business. Play the unlikely heroes fighting to save the world in a post-holocaust environment. This is an action-packed, post-holocaust role-playing game that can be played straight and serious, or with a touch of satire and humor. Back in 1999, this RPG was inspired by fears of the Y2K Bug and possible end of the world as we knew it. So THIS game is an alternate Earth where Y2K was a real event and worse than anyone could imagine. Enjoy the wild characters and setting, and destroy some Bugs! A complete, stand-alone role-playing game. S.D.C. setting and all the info you need to play. The Villains: Monstrous invaders from another dimension drawn to all things electronic. Deadly and weird. The Unlikely Heroes: Society's castaways, nutcases, and survivalists. 11 O.C.C.s including the Exterminator, Freebooter, NORAD Psychic and more. Reclaim the world for god-fearing humans! Plenty of world information and adventure ideas. Written by Bill Coffin based on concepts by Kevin Siembieda. Includes Conversion Notes for use with Rifts®, Heroes Unlimited™ 2nd Edition, Ninjas & Superspies™, Palladium Fantasy RPG®, and other Palladium game settings. Loads of fun! 144 pages – $22.99 – Cat. No. 650 – Back in print just for the holidays. Available now! 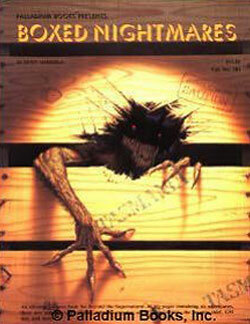 Boxed Nightmares™ is exactly what the title suggests, ordinary people coming face to face with supernatural nightmares. The adventures are designed to give players and Game Masters a better idea of the variety and scope of adventures one can explore in the world of modern horror. Some adventures are short, others long. Some are monster stomping action, while others require investigation, cunning, and the uncovering of clues. The newspaper portion is in the back of the book. It is one of those sensational, check-out counter tabloids that boasts headlines like Woman marries Big Foot, or Elvis’s clone living in Tampa. However, this tabloid is tied to the adventure portion of the sourcebook in several different ways. First, it contains clues and information for the actual adventures inside the sourcebook. Second, the publishers of the paper often hire psychics and parapsychologists to investigate strange phenomena, so your characters could be working for the tabloid company. And third, it may give you ideas for additional adventures. Rules and tips for creating secret organizations. Adventures in the USA, South America and Australia. Crazed Arcanists, Gremlins, Tasmanian Devils, a Possessing Entity that has absorbed the memories of a serial killer, and more. The After Midnight tabloid, filled with clues and adventure ideas, reproduced in the back of the book. Cover by Denis Beauvais. Interior art by Kevin Long. Written by Kevin Siembieda. 112 pages – $17.99 retail – Cat. No. 701. Back in print just for the holidays. Available now! The forces of Light and Darkness clash as never before in the modern setting of the Nightbane® RPG. More info on the Lightbringers, Nocturnes, and other factions. Fallen Guardians and the mystery of the Reapers. Psychic Agents and new psionic powers. The vampire conspiracy and an outline for adventure. 11 (optional) O.C.C.s, many are part of Project Pandora. Astral Realm of Tophet and city of Pittsburgh, NPCs and more. 160 pages – $22.99 retail – Cat. No. 734. Back in print just for the holidays. Available now! A series of books that collects all the notable monsters, dinosaurs and creepy crawlers and creatures of Rifts® North America (US, Canada and Mexico) into two juicy volumes with a number of new creatures. Each volume includes maps and new creatures, large and small, to help or plague player characters. Between them, these two volumes compile all the beasts of Rifts North America (unintelligent monsters, predators, notable animals and intelligent beings that are monstrous or animal-like in appearance or behavior) from all current World Books and Sourcebooks. In addition, Kevin Siembieda, Chuck Walton and Greg Diaczyk are adding some new monsters to make life in the wilderness interesting. Presented in alphabetical order, with maps showing their range and location, in two big books. Winter releases, both volumes are being worked on simultaneously, right now, so that Volume Two will quickly follow Volume One within 4-6 weeks. Other volumes, like a Bestiary of Spirits and the Supernatural, are likely to follow. Future volumes will include spirits, ghosts and entities, another on dragons, other volumes on creatures in other parts of Rifts Earth, and so on. Monsters and animals of Rifts North America organized in two big, easy to use sourcebooks. Predators, exotic riding animals, beasts of burden, alien horrors, giant insects and more. Some new creatures, but most are existing creatures. Updated and uniform stat blocks. A map for every creature showing where it is found. Art by Chuck Walton, Siembieda and many others. 192-224 pages – $26.99 retail – Cat. No. 896. In production. More of notorious Rifts® monsters and animals, old and new, everything updated and expanded. Monsters and animals of Rifts North America organized in two big, easy to use sourcebooks. Updated descriptions and information for existing monsters. New predators, exotic riding animals, beasts of burden, alien horrors, giant insects and more. 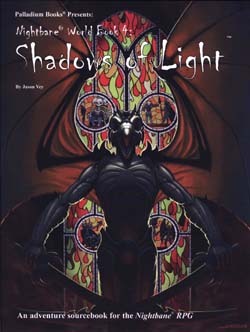 Fully illustrated, much of the art by Charles Walton II, along with Siembieda and many others. 192-224 pages each volume – $26.99 retail – Cat. No. 897 (Volume Two). In production. End of December. “People will tell you no one can survive in the big cities. They are wrong.” – Brad Ashley, Leader of the Road Reapers in the Zombie Apocalypse. This sourcebook is all about inner city survival. Survivor colonies finding a way to live and prosper in the big city. The conventional wisdom is that living in the big population centers is impossible. These survivors prove otherwise. Surviving in big cities crawling with zombies. Death Cults, a different type of danger. Gangs, street runners, the new underground, and more. Heroic Masked Lunatics as player characters. Take your zombie campaign to new heights! Cover by E.M. Gist. Interior art by Nick Bradshaw. Written by Kevin Siembieda. Adaptable to other settings. 96-128 pages – $17.99 retail – Cat. No. 237. Winter release. Matthew Clements is still adding to his considerable contributions to Garden of the Gods before turning it in to Palladium. Matthew has started work on another Fantasy sourcebook and other projects. The Garden of the Gods is said to be a holy place watched over and even frequented by the avatars of the gods. According to legend, the god may visit heroes and followers in dreams or in person by an avatar of the god, to be given guidance, inspiration, heroic quests, and gifts of knowledge and magic. More details about this title will follow. The Garden of the Gods described in detail. Gifts of magic and knowledge. The Black Pit, a place of evil and dark secrets. Is it a counterbalance to the good of the Garden or a trick of the Old Ones? Final page count and price yet to be determined, but probably 96 pages – $17.99 retail – Cat. No. 475. Winter release. Beyond the Supernatural™ RPG is supernatural horror in the modern world. A plausible modern horror setting that makes sense and will have you wondering if this stuff could be for real. Play ordinary people, psychics or paranormal investigators. 42 occupations for “ordinary” people. 100+ psychic abilities, including Fire Walker abilities. Creatures of darkness, the Lazlo Agency, and more. Three new sourcebooks planned for 2019. 256 pages – $26.99 – Cat. No. 700 – available now. Rifts® Mystic Russia™ – setting information, key people and places, demons, monsters, gypsies and magic galore. 18 Archaic Russian Demons and 10 monsters. Russian magic including Fire and Bone Magic & magic weapons maker. Magic O.C.C.s including Night Witch, Hidden Witch, Mystic Kuznya, Fire Sorcerer, Old Believer and Necromancer. 9 Gypsy O.C.C.s, vehicles and more. 176 pages – $22.99 – Cat. No. 833 – Available now. 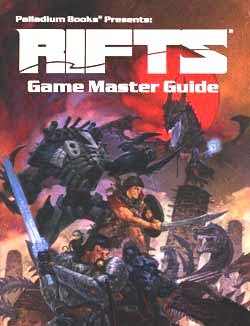 The Rifts® Game Master Guide™ is a massive 352 page reference book with short stats and description on every Rifts® robot, power armor, body armor, vehicle, weapon, gadget, skill, experience table, and map that appears in Rifts® World Books 1-23 and Sourcebooks 1-4, plus a bionics index, an O.C.C.s and R.C.C. index, rules clarifications, combat examples, advice on how to run a game and more. 100+ suits of body armor. 80+ suits of power armor. 352 pages – $28.99 retail – Cat. No. 845 – Available now. Rifts® Rifts® Ultimate Edition RPG, Hardcover – core rules, epic setting of science fiction, fantasy, and horror in a future Earth post-apocalyptic setting. 30+ player characters – play a Dragon Hatchling, Cyborg, Juicer, Crazy, Cyber-Knight, Power Armor Pilot, Psi-Stalker, Dog Boy and others! Magic, psionics, weapons, bionics, and more. If you can imagine it, it can happen in Rifts®. 376 page hardcover – $41.99 retail – Cat. No. 800HC – available now. Rifts® Book of Magic™ – 900+ magic spells, plus Techno-Wizard devices, Magic Tattoos, Nazca Lines, Whale Songs, Herbs, Symbiotes, Bio-Wizard Weapons, Rune Weapons, magic items and more! 352 pages – still $26.95 retail – Cat. No. 848 – available now. Rifts® Adventure Guide™ – 150+ adventure ideas, Random Rifts, making towns, cities, merc companies, and traveling shows, gaming tips and much more. 192 pages – $24.95 retail – Cat. No. 849 – available now. Rifts Conversion Books 1, 2 & 3. HippoTV on Twitch.tv. The good folks at HippoTV (https://www.twitch.tv/HippoTV/) host a wide variety of games most days of the week. For fans of Palladium Books® they feature a Heroes Unlimited™ and an After the Bomb® space game. The gamers playing these games come from all over the world, are very enthusiastic, and represent a wide variety of experience with Palladium's games. If you are doing a Palladium fan-based website, podcasts, YouTube programming, etc., please let us know so we can take a look at what you are doing and so we can give you a shout out. We do not have the staff and resources to do everything we want to do, so we appreciate the fan sites that feature Palladium Books’ games and settings and promote the RPG hobby. Awesome. We are happy to support you when we can. The Rifter® #82 – Available now – special Erick Wujcik tribute + source material for Rifts® Chaos Earth® (Pyromancer and more), Nightbane®, Rifts® and more. Available now! 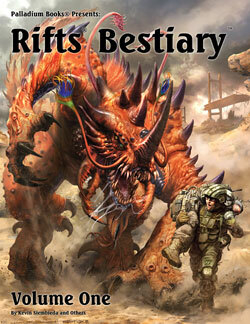 Rifts® Bestiary™, Volume One – Coming soon. Rifts® Bestiary™, Volume Two – Coming soon. 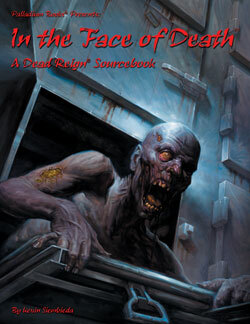 In the Face of Death™, Dead Reign® Sourcebook – Coming soon. The Rifter® #83 Coming soon. The Rifter® #84 – Coming. And much more in development for Rifts®, Palladium Fantasy RPG®, Heroes Unlimited™, Dead Reign®, Beyond the Supernatural™, Splicers® and more!